A four bedroom, 4.5 bath retreat. Occupies 8,300 sq. ft, of prime location overlooking Chalk Sound National Park. A six – bedroom, four bathroom beachfront villa, split into two detached suites joined by an outdoor central pool. Chalk Sound, Providenciales. Nine bedrooms and eight bathrooms, including it’s three guesthouse suites that together sleeps eight to eighteen people. A colonial style property with ocean views overlooking Long Bay. This elevated two-storey house benefits from four bedrooms, four baths, a modern kitchen and living room on each floor. The property occupies an acre of land and sleeps 2 – 12 people. Long Bay, Providenciales. WHITE VILLA is a beautiful retreat located on the southeast of Providenciales, in Long Bay Beach, in front of a beach access. This 2 bedroom/3 bathroom villa built in 2016 accommodates up to 6 people. White Villa features large windows throughout, retracting overhead doors, a large terrace, a hotel-style pool, stylish private bedrooms and bathrooms. Special transport for wheelchair guest, to and from Airport, Hotels or anywhere on the island of Providenciales, Turks & Caicos. Periwinkle in Grace Bay, TCI, is an upscale 2 bedroom, 2 1/2 bathroom town home located in a quiet, electronically gated compound of Palmyra, a few minutes’ walk from famed Grace Bay beach, plentiful restaurants, shops and an exciting nightlife! Angelfish Reef Villa Rental, Turks and Caicos, beautifully renovated in Chalk Sound, provides creature comforts, privacy, romance; all combined with amazing views! Welcome to an extraordinary Caribbean honeymoon or romantic retreat. Rejuvenate your soul in this romantically secluded home surrounded by shimmering turquoise water and soothing, refreshing tropical breezes. 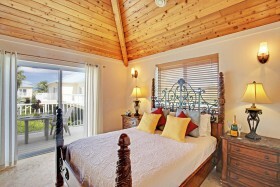 Enjoy hours of privacy, beauty and comfort at Edenhouse vacation villa, Long Bay, Turks and Caicos. This newly built luxurious home has to be seen to be believed! Brand new to the TCI rental market and nestled amid the rich, natural, flora and fauna of the residential neighborhood of Long Bay.